A truck camper is a recreational vehicle that can be attached and carried in the bed of a pickup truck. 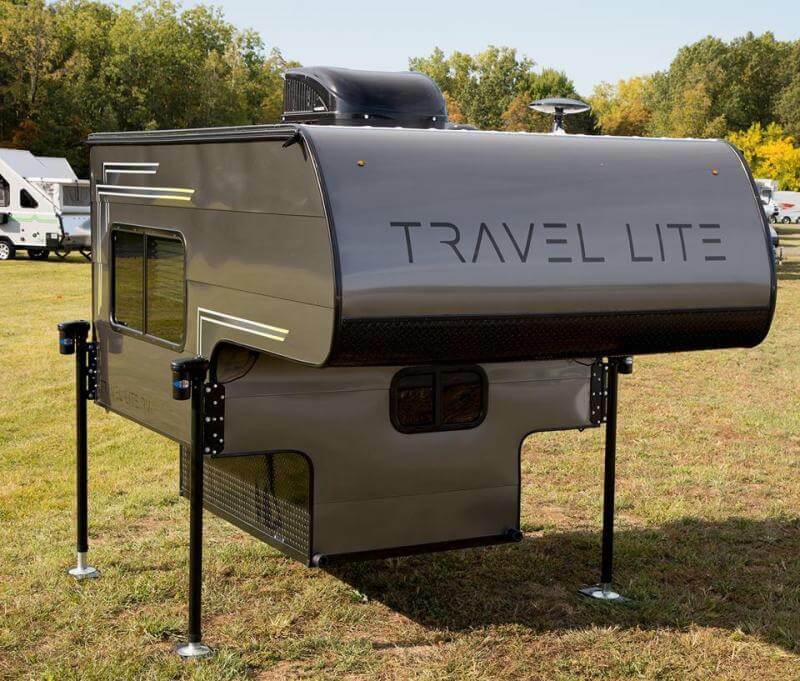 It can be as simple as having a topper over the truck bed or attaching a full-RV build complete with a cab-over style, amenities and features to the truck bed. Also referred to as slide-ins by many, these campers offer the cheapest route to the RVing lifestyle and are easily the smallest of RVs available today. Statistically speaking, wholesale shipments of truck campers in the US were higher by more than 26% in 2018 as compared to the previous year. Hardside campers have a fixed height and are usually heavier than other options. They are easy to access unlike pop-up campers whose height must be adjusted first before use. On the other hand, Softside truck campers, also known as pop-ups have an easily adjustable height and usually give better gas mileage than hardside ones. They have a low-profile stealthy look that reduces weight and wind resistance, making it perfect for urban camping and off-road trips. The pop-up mechanisms are also easy and quick to operate. Basement models are installed above the wheel well while non-basement models are slid into the wheel well. Basement models tend to be wider and taller with underneath storage and more floor space but can be unsuitable for off-road traveling. Non-basement versions have shorter heights and are more tailored for boondocking in expense of adequate floor space and storage. A camper shell topper consists of a topper mounted onto the truck bed rails or on bed sides. It has limited space and will not allow standing up inside. The truck toppers are mostly made of fiberglass, aluminum or even canvas. Depending on the material, you can get a custom-made mold or standard-size mold for your truck. It also makes for fun and cheap DIY project as you will have to build the interior to your liking. The basics of the interior will include a carpet flooring, storage cabinets and bunk for sleeping. Use metallic arrow brackets and appropriate tools to install and hold the bedframe in place on the truck bed. A memory foam mattress and a sleeping bag can make for the sleeping option, Velcro curtains for privacy, and a fan for ventilation. The cabinets can be used for storage. This camper is permanently mounted on the chassis, with the truck bed removed for more floor plan options, living and storage space. Sleeping options; cab-over queen size bed and/or convertible options, memory foam mattress/sleeping bag. Dry or wet bath style depending on the model and type of truck camper. Storage; exterior lockers, drawers and cabinets. Air conditioning and ventilations systems. Side and/or back awning with exterior lighting. Kitchen; Two-burner cook stove, fridge/freezer, kitchen sink and countertop, dinette slide-outs and pull-outs. Propane Tanks and holding tanks. Power supply; generator, inverter, solar panel kit. More amenities and features increase the total weight of the camper and will definitely require a higher payload capacity on the truck. Some models also go all-out in terms of space by having bump-outs and slide-outs for maximum living and storage space. However, this also means more power usage on the sliding mechanisms and extra weight. Almost all RVs have a north-south bed for the main sleeping quarter and east-west styles for side bunk beds. Truck campers have their bed in the cab-over area of the RV and will utilize a north-south bed design. Some versions also include back steps with a pull-out porch and underneath storage compartment. GVWR – The Gross Vehicle Weight Rating is the maximum loaded weight of the truck beyond which lurk safety and component failure risks. It will include the weight of the whole truck (fuel and engine fluids included), cargo, driver and passengers. GAWR (front and rear) – The Gross Axle Weight Rating indicates the maximum weight that can be supported by each axle on the truck. The total axle capacity is always higher than the GVWR to allow for a safety margin in cases of bounces. Payload Capacity – This is the maximum allowed load that the truck can carry. It can be determined by subtracting the weight of truck with all fluids (engine oil and fuel) from the GVWR or simply Payload = GVWR – Kerb Weight. Tire Ratings and Braking capacity may also affect the maximum payload capacity. GVCR – Gross Vehicle Combined Rating gives a maximum combined loaded weight of both the truck and camper/trailer. GTW – The Gross Trailer Weight is the weight of a fully loaded trailer/camper with cargo, passengers, full holding tanks and everything else. Always weigh your rig at the scales for reliable calculations. Other concerns is if you will be towing anything else behind the truck for which you must consider the weight limits and towing capacity of the vehicle. Some campers may extend up to two feet from the rear of the truck and thus a hitch extension may be required to help with the towing. This information is set by the manufacturer and can be found on stickers on the driver’s door, glove box and the truck’s manual. Alternatively, you can check with the manufacturer’s website or customer care for further clarifications. Commercial weight stations can also give you more precise and practical measurements of the weights of the truck and camper. Exceeding weight limits endangers your life and that of others on the road and may void your insurance cover in case of an accident. The payload capacity of the truck will dictate which type of truck camper to get or go for a different pickup truck altogether. Other factors include length of truck bed, cab options and added features. Pickup trucks come in mostly ½ ton, ¾ ton and 1 ton options. Truck campers have been around for decades and are available for every length of bed possible. Obviously, a shorter truck bed will require a smaller-sized camper. Cab style, be it single, double or crew cab style, will also determine what the size of camper to get. Generally, a dually (dual rear wheels) with a standard single cab and a gasoline-powered engine will tend to have a higher payload capacity as compared to other options. Dual rear wheel trucks also tend to offer better stability and handling, but may not be the right choice for off-roading. The truck’s tire ratings and suspension affect the truck’s handling and safety. Go for a combo that can handle the weight of the truck and camper. The tires should be properly inflated and suitable for the given climatic conditions; all-season highway tires are a better option. Test out the suspension with the camper on to avoid expensive upgrades further down the road. Getting extra upgrades like heavy-duty shocks, four wheel driving options, steel wheels and a super hitch/winch among others will also considerably lower the payload capacity. The frame of the truck camper may be made of all-aluminum, wood, aluminum & wood or a clam shell fiberglass build. While the choice of either will be subjective, a few facts on each of the framing styles may help you make the right decision. An all-aluminum frame, although expensive, is more durable and lightweight, while a wood framing tends to be quieter, stronger, well-insulated and cheaper to repair. A clam shell design is also standard in many truck campers; it implements a fiberglass construction style similar to that used on boats. Hardside truck campers may also use Filon (fiberglass on a wood backing) material over the above mentioned framing materials. Pop-up truck campers will as well utilize a fabric layer for flexibility when popping up the unit. Weblon or canvas material offers the most durable and functional option in pop-ups. Preparations. Ensure that the payload capacity of the truck exceeds the camper’s wet weight. Bring in the Slideouts and bump outs if present to prevent toppling the camper when backing up. Remove the license plate from the truck and install it to the back of the camper else you will be forced to crawl under the camper to do so. Clear any obstructions that may limit the ground or overhead clearance like sewer/water hookups, low hanging branches and so on. Lifting the camper. Power up the jacks and lift the camper to a suitable height. Electric jacks consume a considerable amount of power therefore have a running generator or connect to an electric hookup. For manual jacks you may require an extra hand to help you raise it to the required height. Aligning the camper to the truck. String the electric cord to the front of the truck for trickle charging the camper’s battery and easy plugging in to the camper. A rubber mat on the truck bed can help with improving traction and cushioning between the truck and the camper. You can place a colored tape in the middle of the truck bed and in the middle of the front of the camper for easier alignment. Marker lights on the truck and camper can also help in aligning the two. Slowly back into the camper until it fits as it should, into the truck bed, after which you will lower the camper into place. Securing the camper in place. Trucks may have bed, frame, bumper or other custom mounted tie-downs for providing anchor points to the camper. Use turnbuckles to secure the camper in place, the ease of which will depend on the type of turnbuckle you have. Lever-action types are the easiest to install and remove. Other types of turnbuckles include those with tension indicators and basic chain mechanisms. Wiring and other final touches. Plugin the electric cord to the camper, ensure all the outside panels/lockers are closed and you have working tail lights on the camper. Now you are READY to go! As a safety measure, always check regularly if the camper is well aligned or properly fastened to the truck bed especially after an off-road trip. Truck campers will have a wet-bath, dry-bath or no showering/toilet facilities at all. A wet bath saves on overall space in the camper while a dry bath aims at comfortable living with its toilet/bathroom separations. The bathrooms in truck campers also take advantage of a skylight for maximum headroom and natural lighting. Black tank flushing systems will require use of dump stations or RV Park hookups to dump sewer while a cassette toilet offers a low capacity but convenient in handling sewer disposal. A porta potty can also come in handy if you don’t have a toilet in the camper. Use biodegradable soaps and detergents for easier disposal of grey water. Some models come with showerhead connections on the exterior where you can also use removable shower curtains for that quick shower. Alternatively, showering in Rec centers and RV parks is the most hassle free option if you don’t have a bathroom or just want to save water. A Laundromat is your best option for doing laundry as a washer/dryer set may not fit in the camper as well as consume a lot of water and power. To improve on the overall stability and handling of the truck camper components such as a sway bar, cab-over shocks, upgraded tires, inflatable airbags or add-on overload springs on the rear suspension may be installed. For a saggy truck rear, installing additional leaf springs can help remedy the situation. A long truck bed can help you balance the weight of the camper over the front and rear. The center of gravity will be off if the front axle weighs less when the camper is mounted on the truck. Simply reload the camper while ensuring that most of the weight is in front of the rear axle then you will be set to go. To lower camper’s weight, you may opt for truck campers with less amenities and features. This includes those without Slideouts and bump-outs, those with wooden body frames instead of an aluminum-built one, manual jacks instead of electric ones, less battery packs and propane tanks depending on your preferences. Dimmed-out/tinted windows with bug screens help keep off bugs and block outside light for a goodnight’s sleep. A large capacity battery with jumper cables and power banks can help counter power issues when on the road especially for boondocking trips. Propane refills will also be a concern especially during winter because of the constant use of the furnace for heating. Keeping in mind that the propane powers up your generator, cooking stove, hot water heating, fridge and other appliances. Expect more refills during winter and lesser ones during summer, however this will be subject to how you use your propane reserves. Why Should You Own A Truck Camper? An entry-level truck camper costs around %3,000 to %15,000, which is by far the cheapest solution for temporary accommodation while on the road. Pickup trucks cost from $20,000 to $50,000 and in general offer the best fuel economy ranging from 10mpg to 16mpg or even more. This can be further increased by reducing the number of amenities and features in the camper. Eco-friendly options like those powered by vegetable oil and bio-diesel claim upwards of 18 to 20 miles per gallon, thus saving you money on fuel and protecting the environment at the same time. You also save on insurance premiums, registration, maintenance and storage fees since pickup trucks are generally small in size and very low-maintenance. Truck campers can be parked anywhere you want and with overall lengths of less than 25 feet, you can access as many campgrounds, national parks, beaches and remote locations as you like. This coupled with four wheel drive capabilities in most trucks make them the best choice for boondocking. Additionally, they offer the best turning radius allowing for superior maneuverability, reversing and handling. Their compact size allows the truck camper to remain very warm and cozy throughout the night. Furthermore the size is not as intimidating to drive as that of a Class-A motorhome. Even though it is relatively light and mobile, you can still lift-off the camper and enjoy the full-performance of the truck for daytrips and errands. This disconnection makes the truck campers more advantageous over one-unit RVs like motorhomes. 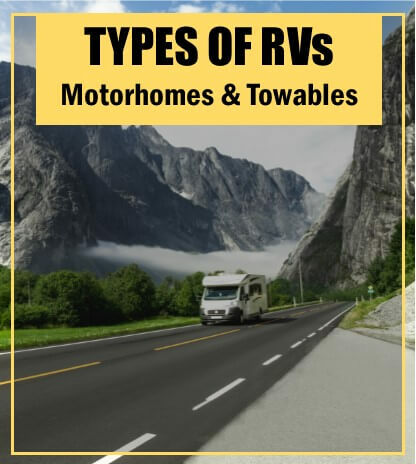 For instance, when a motorhome breaks down it means you have grounded or even lost your home-on-wheels altogether. The cab-over bed design also keeps off dirt and clutter away from the sleeping quarters allowing for better organization and a comfortable sleeping space. You as well don’t need extra registration or a special driving license for this type of RV. A truck camper is also easy to winterize and can fit in any driveway or garage. Truck campers excel in venturing into the less traveled roads, accessing and maneuvering into smaller places due to their short lengths as well as staying in a stealth mode due to their small sizes and low profile bodies. They also have large capacity battery packs and large holding tanks for prolonged boondocking without the need for hookups. Add some four wheel drive options and a generator or solar panel kit into your truck camper and you will have the best possible RV for boondocking. Space is the biggest drawback in truck campers as you may lack adequate living/storage space plus some basic amenities. Some campers don’t even have toilet/shower facilities in them hence making them more suited for one to two weeks’ vacation trips and not ideal for fulltime RVing. Also, they can only sleep in two people at the most. Headroom is also a concern in truck campers, it is impossible to stand/walk in an upright position in most truck campers. Due to the limited storage space in these RVs, you must pack light, have a home base or rent a storage container for keeping your possessions. The height of the camper plus the cab-over design may cause it to teeter-totter in windy conditions even at moderate speeds. This results to a very poor performance in tall truck campers when off-roading. The height is also still too high and can limit your access to some carwashes and gas stations. Winds are the biggest enemy for these type of RV, whether you are driving, setting up or trying to get some sleep. Winds can easily sway the truck camper thus affecting its stability especially when on the road. The swaying will also affect your sleep in a great way plus the camper must be parked in a level spot for a comfortable night’s sleep. You need to be aware of overhanging tree branches and building structures else you risk damaging the camper’s roof or other roof-mounted components. Loading the camper can be a challenge as you have to align both the truck and camper perfectly into place or opt to never take off the camper altogether. The compactness of a truck camper also poses moisture control issues thus having a proper ventilation system and/or a dehumidifier becomes more crucial than ever in this RV type. It requires a lot of organization to enable easy cleaning. As Vernon Howard, an American author and philosopher put it, “You have succeeded in life when all you really WANT is only what you really NEED”. Truck campers instill a minimalist approach to RVing with a huge emphasis on a fun outdoorsy experience instead of amassing many indoor comforts as is the case with most motorhomes. Truck campers are the go-to option for a budget friendly RVing lifestyle, you may not even have to get a new pickup truck for this RV type.